Tag line: "A zombie needs only one thing....The Living"
The Resident Evil franchise gets better with each successive entry. After being less than impressed with the original movie, I found its sequel (the admittedly flawed Apocalypse) a tad more enjoyable. With 2007’s Extinction, the series delivers its best film yet. In this 3rd installment, the T-Virus has spread to every corner of the globe, transforming planet earth into a zombie-infested wasteland. In her search for survivors, Alice (Milla Jovovich) makes her way to the Nevada desert, where she hooks up with a convoy that, under the decisive leadership of Claire (Ali Larter), has drained every last drop of gasoline, and every morsel of food, from the surrounding small towns. After finding evidence that a virus-free community may be operating in Alaska, Alice convinces Claire and the others to make the long trek north. But to survive the journey, they’ll need plenty of supplies, and the best place to find some is Las Vegas, which is more than likely teeming with infected. Meanwhile, deep within the Umbrella Corporation’s underground lair, Dr. Isaacs (Iain Glen) continues his search for an antidote to the T-Virus. Upon learning that Alice is in Nevada, Isaacs leads a small platoon into the desert to track her down, convinced her blood holds the key to saving the human race. Directed by Russell Mulcahy (Razorback), Resident Evil: Extinction is a thrill-a-minute horror movie. I admit I was a little concerned early on, when a showdown between Alice and some infected dogs devolved into a sloppily-edited mess (the cuts were so rapid that, for most of the sequence, I had no idea what was happening). Fortunately, the film redeemed itself with a well-executed scene in which Claire and her convoy are attacked by thousands of infected crows. Along with the excitement, the movie also offers some effective scares. When Claire asks L.J. (Mike Epps) and Carlos (Oded Fehr, playing the same character he portrayed in Resident Evil: Apocalypse) to make sure a seemingly-abandoned motel is safe, they learn pretty quickly that some of the "guests" never checked out. Perhaps most impressive of all is how Resident Evil: Extinction actually makes you care about its characters, something the first two Resident Evil films never managed to do. With solid performances from Jovovich, Larter, Fehr, and the others (also part of the convoy is Ashanti as Betty, Spencer Locke as K-Mart, and Christopher Egan as Mikey), I found myself rooting for these characters, and even felt a twinge of sadness whenever one of them didn’t make it. 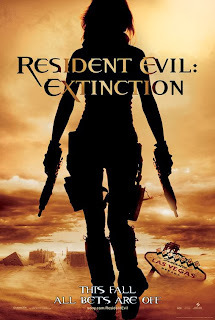 With its awesome desert locale and post-apocalyptic feel (which writer/producer Paul WS Anderson freely admits was influenced by 1981’s The Road Warrior), Resident Evil: Extinction delivers on just about every level, and ends with a cliffhanger so intriguing that I can’t wait to check out 2010’s Resident Evil: Afterlife. If it’s as good as this movie, I’m in for a real treat! As I said when you reviewed Apocalypse, this is probably the best of the series on DVD, for the reasons you state: chiefly the character development, but also some of the action -- Mulcahy is a far better action director than Witt was. The bird attack is great, as you say, and the pace overall has good variety (it relaxes nicely in between the action sequences). The whole cast is excellent, and Ali Larter and Oded Fehr do particularly good work. For example, you see throughout how tough Claire feels she needs to be to lead her people, and it makes it very powerful the couple of times that control slips. I'll be interested to see what you think of the next two (and the one still to come :-) ).